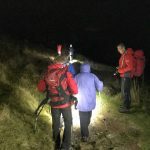 Incident Details: The Team was called to rescue a 35 year old lady who had been walking on Blease Fell with a companion in winter conditions. She was unfortunate enough to slip on wet grass, suffering a serious ankle injury. 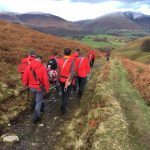 The Team was mobile within 15 minutes, with a plan to access the fell from the Blencathra Centre. At the same time, Control made enquiries as to the availability of air support, given the serious nature of the injury and the danger of hypothermia in the winter conditions. The patient was given analgesia and packaged into a casualty bag and shortly after, Ambulance Control confirmed the tasking of the Great North Air Ambulance. The pilot was able to make a tricky landing not far from the patient, and the medical crew assessed the injuries. A swift evacuation was planned given the deteriorating weather and worsening light, so the casualty was splinted, stretchered to the aircraft, and then flown to the Cumberland Infirmary. Our thanks to the crew of Helimed 58 for their speedy assistance. 17 Team members – 1 hour 56 minutes.